Women prepare sweets as part of an income-generating program in the eastern Beirut neighborhood of Geitawi. 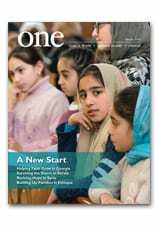 A Lebanese-Armenian Catholic named Ani Kaloust discusses this program and much more — including her extraordinary life — in the Autumn 2015 edition of ONE. For centuries, Hungary dominated the culture, geography and socioeconomic life of Central Europe. Its defeat in World War I, however, cost the nation three-quarters of its territory, all of its coastline, a third of its population and much of its diverse demography. Today, Hungary is a landlocked and largely homogeneous country — a shadow of its former self. In Hungary’s rural northeast — near its borders with Slovakia, Ukraine and Romania — one small community of faith offers a glimpse of Hungary’s multiethnic past. Sheltered by the Carpathian Mountains, some 290,000 people — ethnic Hungarians (Magyars), Gypsies (Roma), Romanians, Rusyns and Slovaks — make up the Hungarian Greek Catholic Church. While each of these ethnic groups maintains its own proud history and traditions, they together have forged a dynamic church authentically Hungarian, Byzantine and Catholic. Hungary’s Greek Catholics were spared the persecutions suffered by Greek Catholics in Romania and Ukraine during the Soviet-dominated era. Though religious communities were closed, priests and religious dispersed, schools shuttered, catechesis limited and non-liturgical activities monitored, the church survived. In 1950, Bishop Miklós Dudás, O.S.B.M., established a seminary within the walls of his residence in the town of Nyíregyháza. While youth programs and sodalities were prohibited, parish pilgrimages to Máriapócs, a little Greek Catholic village famous for its miraculous icon of the Virgin Mary, continued with great enthusiasm. With the collapse of the Iron Curtain, Hungary’s Greek Catholic Church surged to fill the void left after a half-century of despotic rule. Led by Bishop Szilárd Keresztes, Hungary’s Greek Catholic community collected icons, liturgical books, vestments and other sacramentals. These the bishop immediately offered to the once banned Greek Catholic churches in Romania and Ukraine. Because of its central location, Bishop Keresztes suggested that his seminary — dedicated to St. Athanasius — should play a key role in the revival of Europe’s Greek Catholic churches. In 1990, he opened it to Romanians, Rusyns, Slovaks and Ukrainians interested in the priesthood. To improve the quality of the education offered there, the bishop invited an impressive number of foreign educated professors. As a result, the theological faculty became an affiliate of the Pontifical Oriental Institute in Rome in 1995. Formation of lay catechists also figured prominently in the life of the church and in 1992 the bishop signed an agreement with the Teachers Training College in Nyíregyháza and set up a corresponding department at the seminary for the formation of teachers. The Hungarian Greek Catholic Church, which Pope Francis reorganized in March as a metropolitan church led by an archbishop, shares in the socioeconomic challenges affecting the country. Even as birthrates continue to fall, driving down the number of men and women entering priesthood and religious, the demands placed upon the church grow. Increasingly, Greek Catholic priests are working to diffuse tensions between Hungary’s growing Roma minority and ethnic Magyars. And the depopulation of Hungary’s eastern rural villages, the traditional center of the Greek Catholic Church, is affecting family and parish life. Read a full account of the Hungarian Greek Catholic Church here.